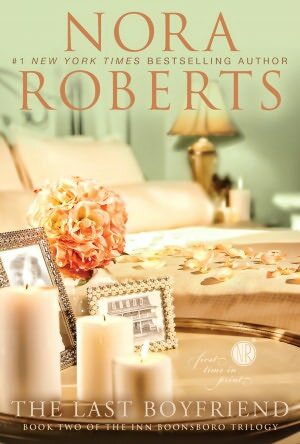 The Last Boyfriend begins shortly after the previous book in Nora Roberts’s Inn BoonsBoro trilogy ended. Owen Montgomery, along with his brothers, mother, and aunt, are adding the finishing touches on the complete renovation of Inn BoonsBoro and getting it ready for the grand opening. Owen is the coordinator/organizer of the family’s construction business and keeps track of all the details. He’s always focused and composed, but when he shares a quick, heated encounter with Avery MacTavish, Owen gets flustered and begins to see his long-time friend in a different light. Avery owns and runs Vesta Pizzeria which is located diagonally across the street from Inn BoonsBoro. She has watched her friends bring the inn back to life and witnessed her dear friend, Clare, find love again with the youngest Montgomery brother. While helping them, Avery shares a kiss with Owen, whom she has known forever and just happens to be the first boy she ever loved. (Granted, she was five and he was eight, but he did buy her a plastic ring from a bubblegum machine.) The kiss leaves Avery and Owen wondering if they should continue down the path of this new relationship or if they should just remain friends. The Last Boyfriend is a satisfying contemporary romance and a book I recommend. It is the second in the trilogy and stands completely on its own, though I believe reading The Next Always first would definitely enhance your enjoyment. It is great addition to the series and has me on pins and needles for the last book, The Perfect Hope, which releases in November. The trilogy sounds lovely. I will check it out. This book was a bit of a miss for me. While I liked Owen and Avery, there were too many little things that took me out of the story. First, it was disconcerting that the first 50 pages didn't even feature Avery. I don't mind all the info on remodeling the inn, but it took away from the romance at the beginning of the book. I also found it odd that everyone seemed to believe that a crush at 5 years old equated to Owen actually being Avery's first boyfriend. This would have been more believable if they were a bit older or if they had at least dated in the first 25 years of their life. They were friends and that should have been the basis of the story. For most of their life, they loved each other but were not in love with each other until this book. Finally, why is it that none of Nora Roberts' characters are ever afraid of a ghost? The paranormal activity in her novels is never subtle. That said, this book has many enjoyable moments, but it's a flawed book. Very good points, Kim. As for the ghost aspect, I would be spooked if it happened to me, that's for sure. In the story, I just went with the flow because it's fiction and the characters believe it. Terrific review, Andrea! I've enjoyed both Inn Boonsboro books, but I must admit I'd rank them a tier or so below my favorite Nora series such as the Quinn Brothers and the Concannons. Thanks, Lisa! As you know, I enjoyed hearing your take on the story. I look forward to The Perfect Hope and dishing with you about that one, too! Great review, I haven't read a book by Nora and a while, must check this one out. I love her trilogies/series. This will be another good addition to her body of work. I have no problem with her including construction and other details on the renovations. Yes, romances are about relationships and HEAs, but I need a story that is about more than just the relationship. We do not live in a vacuum. A lot of life goes on around us. It influences us, what we do, and our relationships. Very well said, librarypat! Thanks! Read an exciting love story in The Last Boyfriend by Nora Roberts. Interesting characters and events, adventures and love - you'll find this in the book.